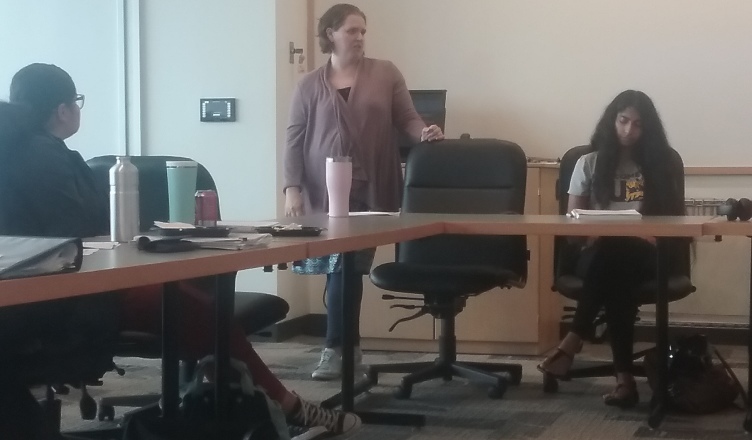 An on-campus presentation, titled “Brown-Skinned Outlaws: The Rhetorical Move to Criminalize Immigrants,” focused on an extension of previous research on the use of the term “illegal” as it applies to immigrants. The event was presented by Jennifer Potter, an associate professor and chair of the Communication Studies Department. This past Wednesday, The Office of Inclusion and Institutional Equity sponsored the Multiculturalism in Action Brown Bag Series in the College of Liberal Arts. Potter provided some history on her work and how the public discourse have discussed immigration and the term “illegal.” She displayed a project timeline on the study which included some important dates such as the Border Protection, Antiterrorism, and Illegal Immigration Control Act of 2005. There were subsequent protests of that legislation by pro-immigrant rights groups. The protest was successful and the bill never passed in the Senate. The phrase “no human being is illegal” was coined and popularized in protest language. Potter studied this significant protest for her work and completed her dissertation in 2008. Then in 2010, there was a “Drop the I-Word” campaign, which was vamped by pro-immigrant rights groups to combat using the term “illegal” to describe undocumented immigrants. The Deferred Action for Childhood Arrivals (DACA) program that was launched by former President Barack Obama in 2012 was mentioned as well to introduce ways to handle people that have been in the United States for a long time. “We were still moving in the same direction in how we understood undocumented immigration from a rhetorical perspective, in terms of public discourse,” Potter said. 2015 was the first time President Donald Trump started talking about building a wall on the US-Mexican border and attaching it to illegal immigration and how it was significant due to his national presence. Potter also discussed Michael Calvin McGhee’s framework for ideographs, which explains the correlation of words for rhetorical and ideological contexts. The words she used to apply this theory are “illegal” as the ideograph and “immigrant.” How the word is discussed in a particular way in a collective is how it’s thought of in a particular way. Other examples of ideographs are equality, heritage, life, liberty, choice, and war on terror. During her study, Potter looked through Washington Post articles that range from Jan. 1, 2000 to Dec. 31, 2007 and studied the changes of the term “illegal.” In the mid-2000s, Potter noticed people use the term “illegals” instead of “illegal immigrants” to describe undocumented immigrants, making the adjective “illegal” into a noun. Media outlets afterwards were using “undocumented immigrants” when that was pointed out. The primary way in which the phrase “illegal immigrants” was used was to describe an influx or infestation, coming from Mexico, Latinx, brown-skinned, Mexicans, criminals, and potential or actual terrorists. Potter also looked through Trump and other politicians’ tweets, White House documents, and speeches. She paid attention to a June 24 tweet from Trump in particular that relates to the children separated from their families. Potter pointed out that the nativist rhetoric and reasoning that those who don’t come “legally” doesn’t have the right of due process, meaning the Fifth Amendment wouldn’t apply. “If we really do understand ‘undocumented immigration’ as whether or not you are ‘legal,’ then that says a lot about the way in which we understand humanness and the way in which we apply that standard across the country.” Potter stated. Freshman Asiah Williams came to the event for her Teaching and Learning in a Diverse Society class. “I’m also a psychology major and hope to do research like this,” Williams said.